Jeff Gordon has been getting a lot of well-deserved tributes in his final NASCAR season, and the retiring racer has been returning the love back to his fans, with the kind of class and generosity that has made him such a great representative for the sport. 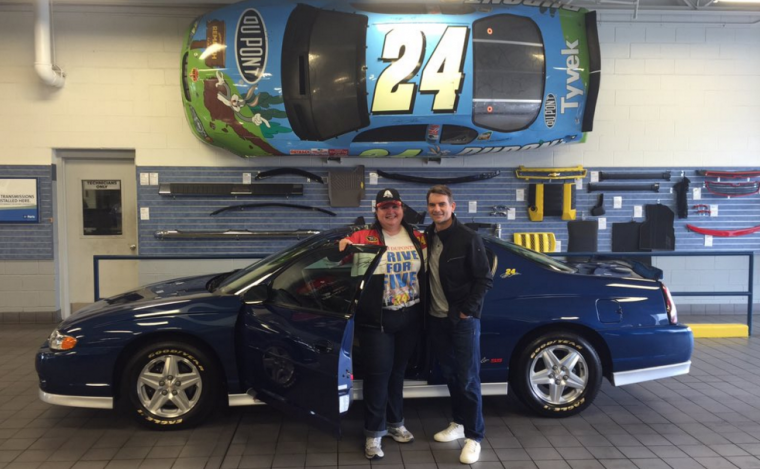 When Gordon met one of his biggest fans, Loraine, at a race in Sonoma, California, she told him that she had hoped to have him autograph her 2003 Jeff Gordon Chevrolet Monte Carlo SS, but she lost it in a fire before they could meet. In response, Gordon brought Loraine to Charlotte, North Carolina, where he gave her his very own ’03 Monte Carlo SS. In addition to being previously-owned (and now autographed) by Jeff Gordon, Loraine’s new ride also has the advantage of having just 124 miles on it. “And listen, don’t let this one burn down,” Gordon says in the video, which is the kind of insightful car advice you can get from a professional driver. Gordon, 43, will be retiring from NASCAR after the end of this season, ending a 24-year career.